Cuddle Soft fabrics (sometimes called Minky) are slick and stretchy. This makes them a little harder to work with unless you understand a few rules. Here are a few tricks that I have found to be very helpful. Using the spray adhesive, fuse the back and the batting together. The easiest way to do this is to lay the batting onto a large table or the floor and then lay the backing fabrics on top. Make sure they are square and straight. Fold the backing back half way and spray a section of the batting. Fold the backing back over the sprayed area. Keep working as if you were working with contact paper. Working with smaller areas will make it easier to maintain control. If you get a few wrinkles, just separate the two and reposition them. After you have secured the backing and batting together, trim so the edges are clean. You want the edges to be even so you can keep everything straight. Fold the batting/backing in half vertically and make a center line with a marker. Fold in half horizontally and make another center line. These will help you with your strip placements. A size 90 stretch needle works the best. A walking foot really helps. If you don’t have one, use pins when working with the Minky fabrics. Even using a walking foot, I gently “help” feed the fabrics through by pulling behind the foot feed. Use a longer stitch (around a 3) and adjust your pressure so it isn’t too tight. The key in making these blankets look so great is the spray adhesive. You will be sewing on a strip, spray fusing that strip down to the batting and then sewing on the next strip. This holds the bottom strip secure so you don’t get the puckers and slips. Use a 3/8”-1/2” seam allowance. I use the ½” because that fits my walking foot and it feeds best. I have based the measurements on a ½” allowance. The fabrics don’t slip as much if you use the wider allowance. Freezer paper is a great protector when using the spray glue. Always protect your quilt, carpet and table or other areas where the overspray may hit. Always work in a well ventilated area. Cuddle soft fabrics are really washable. Don’t be afraid to use, and wash, your quilt. When using a batting, the “sew and flip” method works best using an 80/20 cotton batting. I prefer to use Warm Bond, made by the Warm Company. 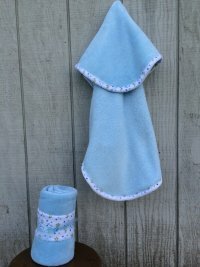 To make a soft snuggle blanket, use the same “sew and flip” method, but leave out the batting. Just sew the strips to the backing fabrics just like you do when using a batting. The cutting measurements for the strips are a little generous. 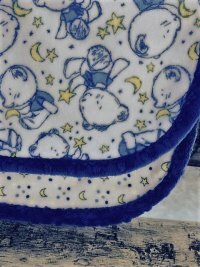 The cuddle fabrics stretch and it is hard to keep them accurate. It is okay to trim off the extra at the end of the strip. Just be sure that you are not letting it stretch too much. This is where the walking foot really helps. Be sure that you are cutting the ends of the strips off square with the other strips. On the larger strips I do not cut them to size, I just sew them on and then trim the ends. I like to use a 2” strip for binding. 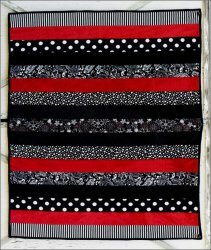 Sew strips together using a diagonal seam as you would when sewing bias strips together. Use a ½” seam allowance and sew the binding on the top side of the quilt. Fold the binding to the back and fold under the extra fabrics. Use a serpentine stitch or another decorative stitch to finish the binding. 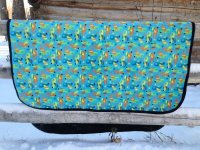 It can be finished by hand, but these quilts are so washable, the machine binding makes the quilt very kid friendly. Good luck with your quilt. If you have any questions just give me a call.